As you may know we believe in supporting our players through an active presence on Facebook and other fora. We also maintain a blog for each of our games. As you can imagine this is very time consuming, time we could use for writing new material. Also, by having separate blogs for each game players do not get to see what else is going on in our range of games. This is a shame as all three games use the same core engine so players may find skills, powers, beasts and equipment from the others that they can adapt to their own games. The current blogs shall not be deleted. There are hundreds of articles, battle reports, tutorials, pieces of fiction and other materials on them we do no want to lose. But they shall no longer be deleted. Most of the additional/bonus materials we have placed on these blogs has been ported across to the new blog, where each game has its own page. Additionally we shall be combing through the original blogs an extracting all the useful articles, dropping them into PDF then placing them in the games pages of the new blog. If you are a regular reader or follower of the original blogs we hope you will now transfer your allegiance to the new. 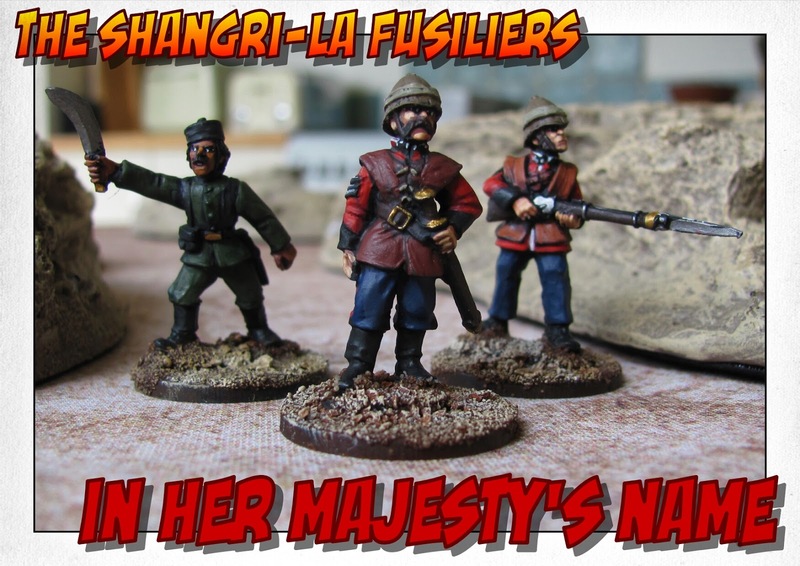 The excellent Major Gordon Richards MC has once more wrought his magic upon IHMN with two splendid new companies for you to enjoy. 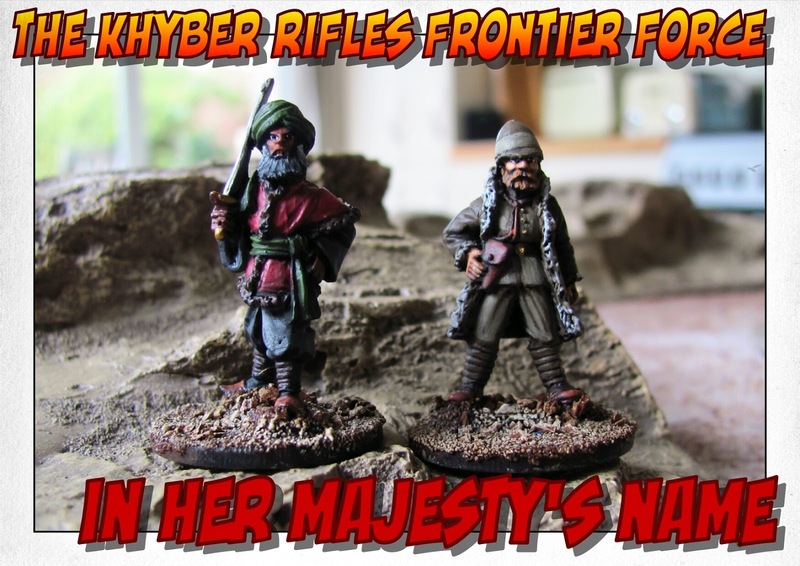 Trot over to here: http://ihavewroughtmysimpleplan.blogspot.co.uk/2016/04/the-khyber-rifles-frontier-force-and.html , to read their backgrounds and full company lists. Roosevelt, don’t shoot the cannon! 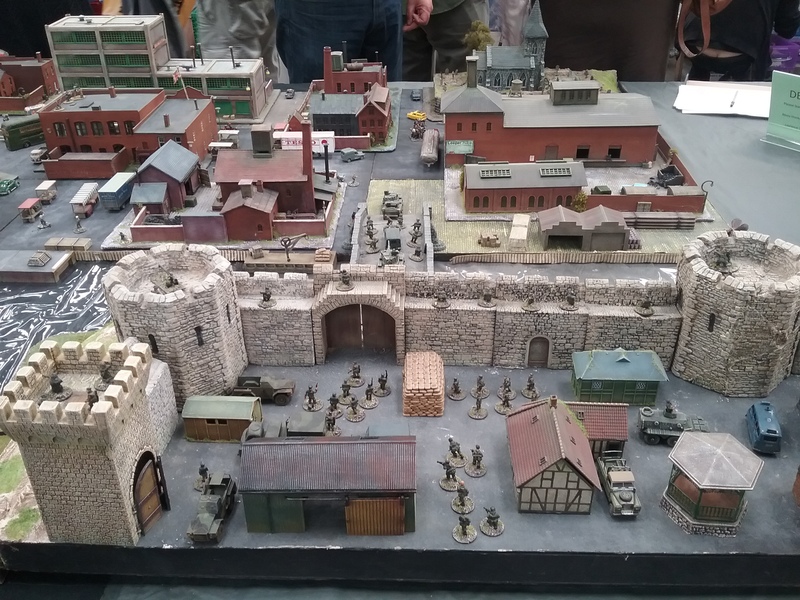 Colonel Sir Nautilus von Reinwald has a blog packed with wargaming goodness including several postings upon IHMN that are well worth the time to read. I like using a younger Teddy Roosevelt as an IHMN character, a genuine American eccentric. 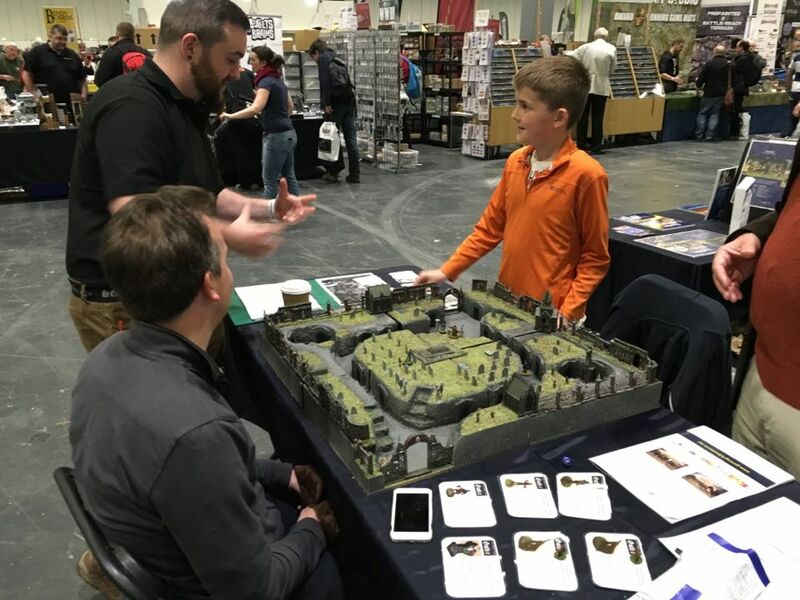 One of the problems of being a writer and purveyor of fine rulesets is that you spend every show you go to demonstrating them on the tabletop and rarely have any time to appreciate the event itself. So it is, that for the last two years, I have not been to a show where I had time to browse the games and traders or chat with people. This year I chose not to sign up for Partizan but instead go along as a humble punter. 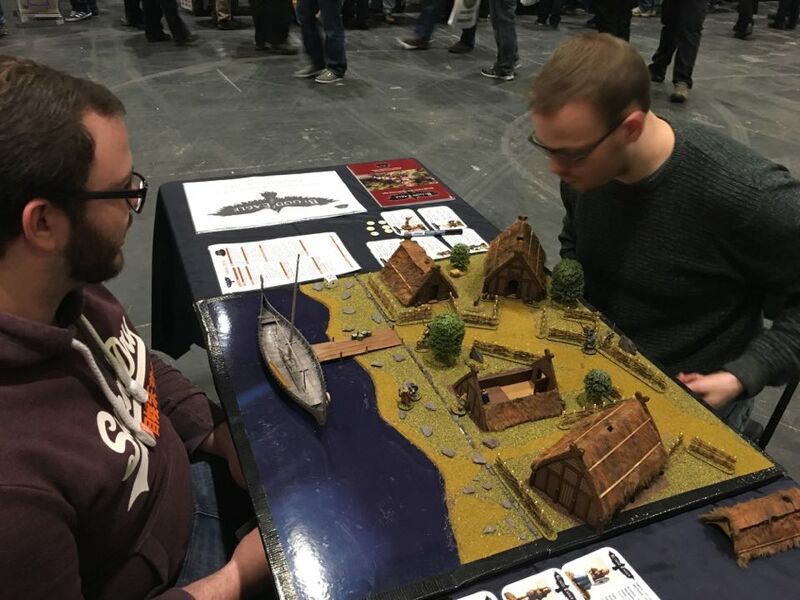 After all, we had already run games at Vapnartak in York, Salute in London and Carronade in Falkirk and honestly, we were knackered. So, along with my good friend Gareth, I set off at sparrow’s fart on Sunday for the long trip from Mid-Wales to Newark. Three hours later we debarked outside the George Stephenson Pavilion on Newark’s showground. Now I have always been a fan of Kelham Hall. It is the most unique location of all the UK shows, being set in a 19th century stately home. Besides the two great halls, one with a magnificent dome, the show sprawled through nooks, passageways, crannies and smaller chambers. However, you could easily get lost inside its labyrinthine structure and many traders and games simply could not be found without a native guide and lanterns. 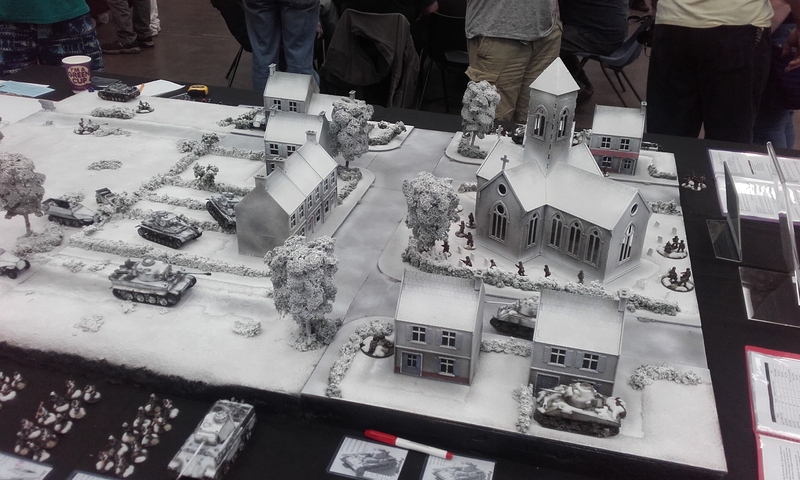 A lovely winter WWII game using the Bolt Action rules I believe. So looking at the ‘aircraft hangar’ in which the new venue was set brought both trepidation and relief. The ‘pavilion’ is a long, tall, metal-clad shed which proved to both light and airy. It has none of the character of Kelham Hall, but brought many advantages, not least of which was being able to find everything you came to see. As usual, the Partizan crew were both friendly and efficient so queuing was kept to a minimum. When a fire alarm went off they acted in a professional manner and no-one felt unduly alarmed. I can only imagine the pandemonium if a fire alarm had sounded in Kelham Hall. For the most part, the traders were spread around the circumference of the pavilion and the games were in the centre, helpfully divided into two zones. The first was for participation games and the other for demonstrations. The passageways around the traders and the games were wide enough to ensure an easy flow and there was less of the feeling of being packed in like sardines that you get in shows set in schools and community halls. Dan Mersey’s new game – The Men who would be Kings. My first port of call was to see Annie Norman of Bad Squiddo games as we had a present for her, a signed copy of Blood Eagle. Annie is an excellent retailer and many of our players have remarked upon the efficiency and friendliness of her service. Then we did a complete circumference of the traders, and what an excellent turnout there was. Now, I had done the sensible thing before coming and taken out a set amount of cash to spend, however, several of the traders revealed a dangerous new technological development; credit/debit card readers that worked through their smartphones – what devilry is this? Fortunately, my card was locked securely in my car or I could have been facing the wife in the divorce courts ere long. 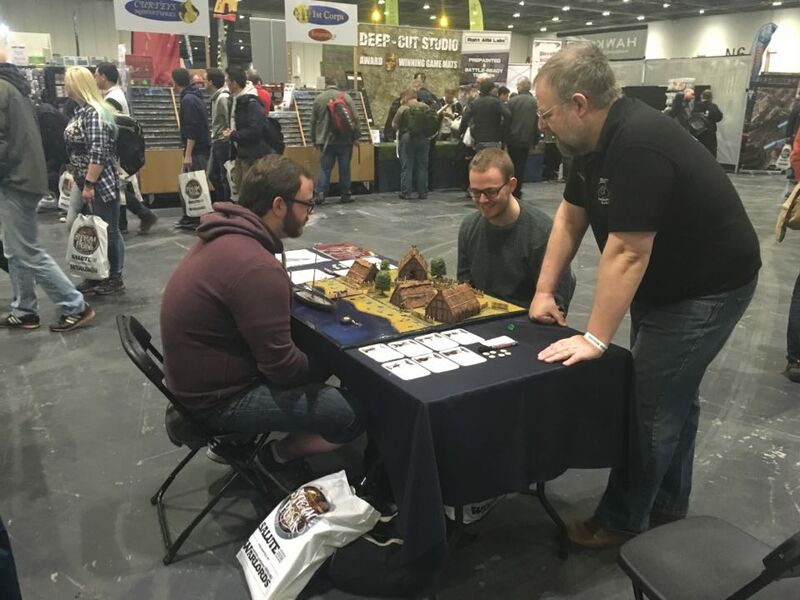 Particularly tempting were the beautiful terrain mats being marketed by at least two traders. The problem is how do you smuggle a 4′ high roll past the missus? A book can be hidden as can a handful of blister packs but a roll – unlikely. As we progressed I was greeted by many splendid chaps, certainly too many to mention without fear of missing one and insulting them. Let it just be said that barely ten yards could be walked without running into someone eager to have a chat. To the Strongest goes Roman! Dave Wise of GCN & COGS. Once again putting on his justly famous fast-play IHMN games for the public. Dave now boasts having every single company from the three IHMN books and Gothic. Not satisfied with that he also showed off his splendid, hand-made, Victorian Daleks. Simon Miller, an old pal and the creator of To the Strongest. He was once more running a very popular demonstration game, this time based on a fictional Roman encounter written by the author Harry Sidebottom. Who just happened to be on hand to chat about it all. A fascinating gentleman indeed. Shaun McLaughlin, Terry and Mick. Shaun was displaying a huge tabletop town featuring the Winter of ’79 game. The whole thing really took me back to my Navy days in the late seventies. A winter of discontent indeed. 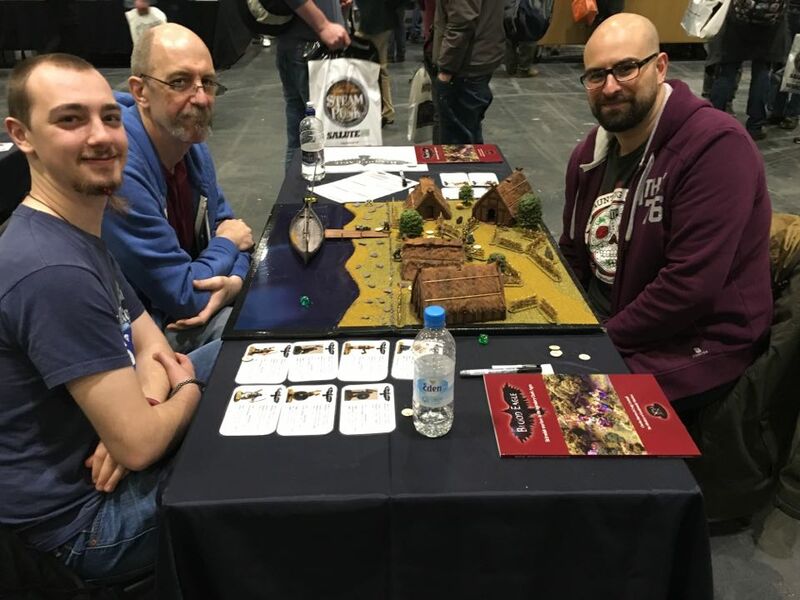 Dave, Karl and Dean of the White Hart gamers. 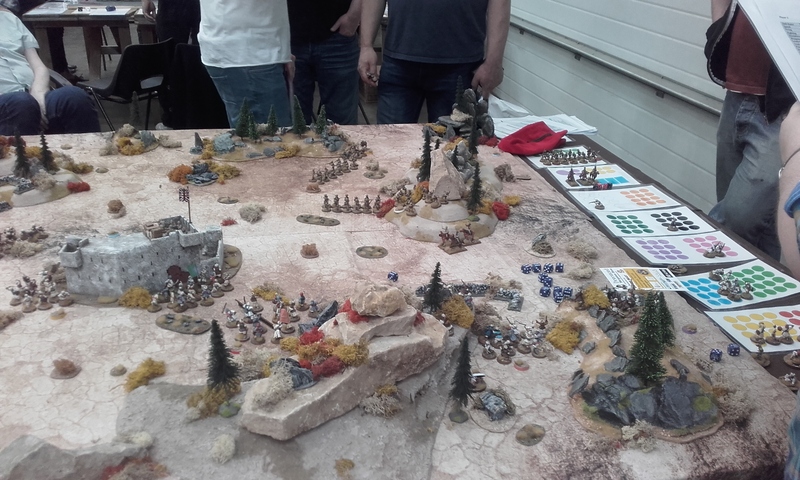 They were running a couple of Frostgrave participation games on the Northstar/Wargames Emporium stand and, as usual, everyone seemed to be having a great time. 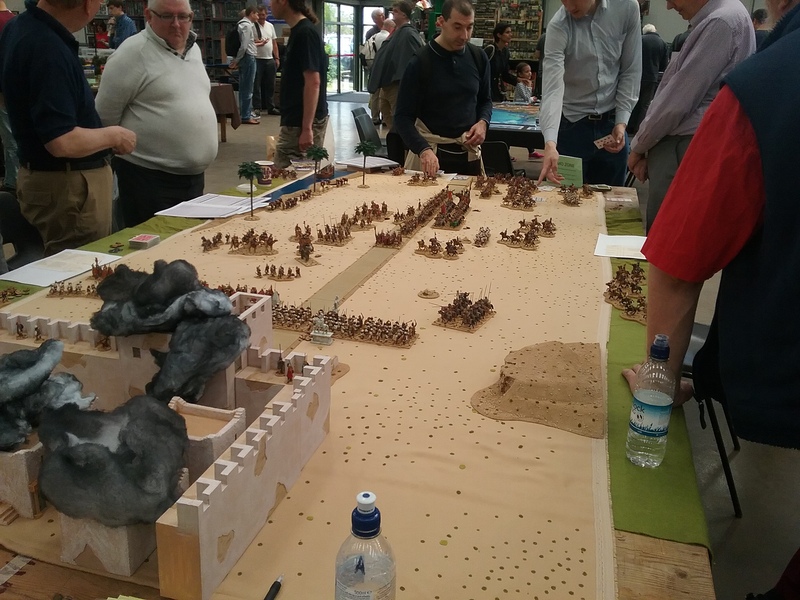 This year, for the first time ever, I managed to make it to the Wargames Bloggers Meet. A dozen or so of the UK’s finest wargames bloggers gathered in a darkened corner and swapped hints, tips and, ideas. I don’t know why but I had expected something a bit more organised. However, the friendly anarchist collective approach seemed to work well enough. I also spent some time talking to the Very British Civil War crew, whose demonstration game was one of the highlights of the day for me. I have admired this game from afar for quite some time and it was smashing to spend some time talking about it with the authors. I just wish I had the time to invest in it and get some games in. 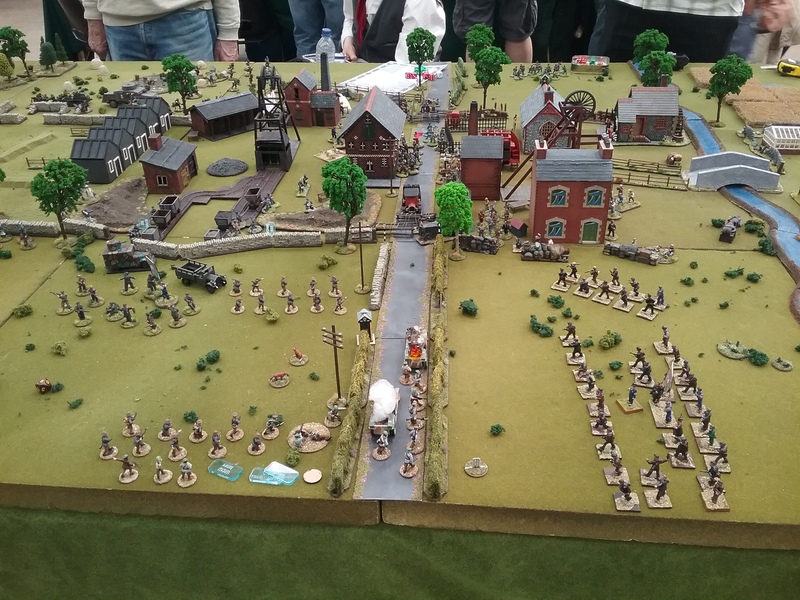 A Very British Civil War game in action. One person I had hoped to meet, but who was not there, was Dan Mersey. There was a lovely participation game of his latest rules The Men Who Would Be Kings run by two of his comrades but, alas,no Dan. To make myself feel better I went and bought Dragon Rampant from Annie. Of course, we met up with our good friend Nick Eyre. Nick and we have a number of secret plans for the next twelve months which we shall let you know about in good time. One thing we can tell you is that we shall be at The Other Partizan in August running Blood Eagle participation games on Nick’s stand. An enormous Winter of ’79 game put on by Shaun Mclaughlin and his merry men. Something I did note was that there were fewer demonstration games where those running it just sat and ignored the public. Salute is especially bad for this, however, all but a couple of games at Partizan were crewed by people keen to show what they were doing. 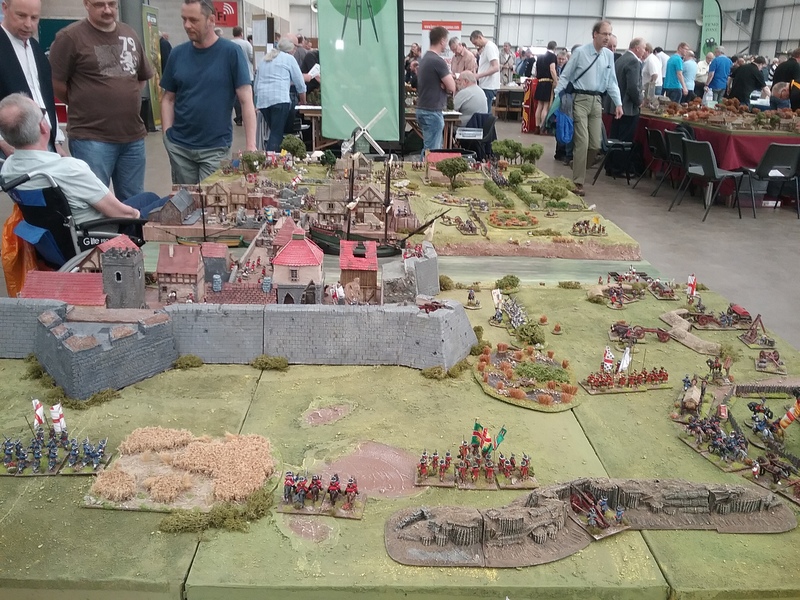 One fellow, whose name escapes me (sorry) was running an Irish game with the Jacobites facing off against William’s mercenary army across some magnificent terrain. The fellow had spent three years putting it all together and the effort really showed. He was using the Beneath the Lily Banner rules, which I had heard of but never seen in action. Overall I think the show has benefited from its move to the Newark Showground. The layout and the light, airy hall makes a real difference to the experience. The Partizan crew, the traders and, the gamers, worked hard to make it a pleasant experience for one and all. It was well worth the long drive over and back. We shall be looking forwards to returning in August to contribute our own game. For all of you going to Partizan next week. The Ministry shall not be running a game, instead I shall be attending as a punter for a change. It will lovely to have time to have time to mooch around the trade stands and observe the various games. The last six shows I have attended we have been so busy that even a toilet break was a hurried luxury. T10 Northstar/Wargames Emporium, our constant friends and distributors of Blood Eagle and Daisho. PG19 COGS/GCN, where Dave Wise and his stalwarts shall be running their infamous fast play In Her Majesty’s Name games once again. DG15 Simon Miller’s To the Strongest! demo. If you want to see how to play a game with several thousand figures in a couple of hours. A little after dawn o’clock Charles, Lorna and I departed our secret lair in the leafy suburbs of Surrey in a car laden to the rafters with our equipment. The M25 was eerily quiet, like in a post-apocalypse movie and the mood in the car was subdued. It was silently agreed that there is not enough caffeine for this time in the morning. By the time we reached the Docks the world had woken up and it was time to get our war faces on. As we have found before the Warlords team are cheery, helpful and, above all, efficient. The car was in and out of the hall in under five minutes and, while Charles went to stable it, we set about unpacking and getting ready. We were soon joined by our friend Matt and the serious business of assembling Billy’s latest masterpiece – a cemetery in old Budapest – was accomplished. The Ministry of Gentlemanly Warfare had been planning for Salute for several months. Charles’ organisation and checksheets ensured that nothing was forgotten and, that everything was in its assigned place. 3. The old cemetery in Budapest for IHMN Gothic. Three battlefields, three masters of the games (cough) and our Maitre ‘D, Lorna on front of house. We stood back to admire our work but only had moments before the starting gun was fired and the horde descended upon us. Over the next seven hours, we ran at least nine games of Blood Eagle, seven of Daisho and six of IHMN Gothic. 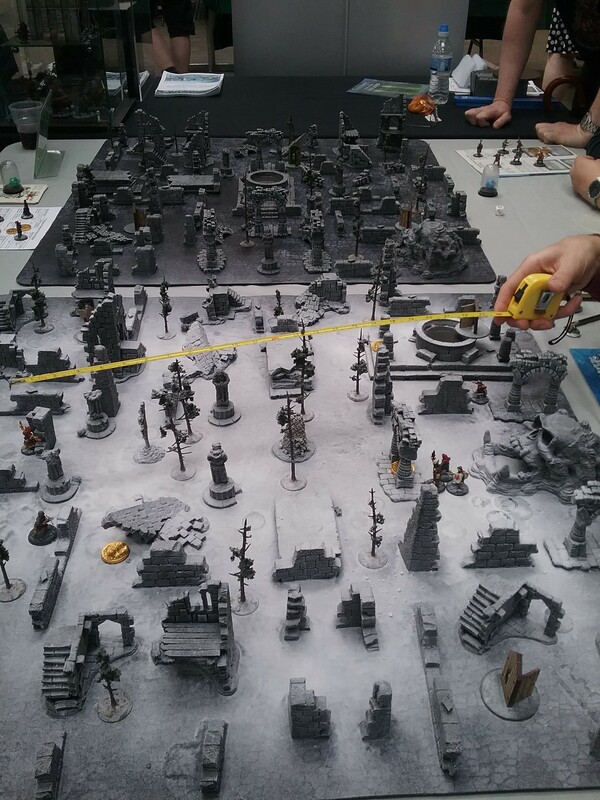 This may not seem much until you realise that each game took 30-45 minutes, required us to instruct and entertain forty-four people from eight to seventy years old, in a hall with the acoustics of an aircraft hanger and several thousand people in. 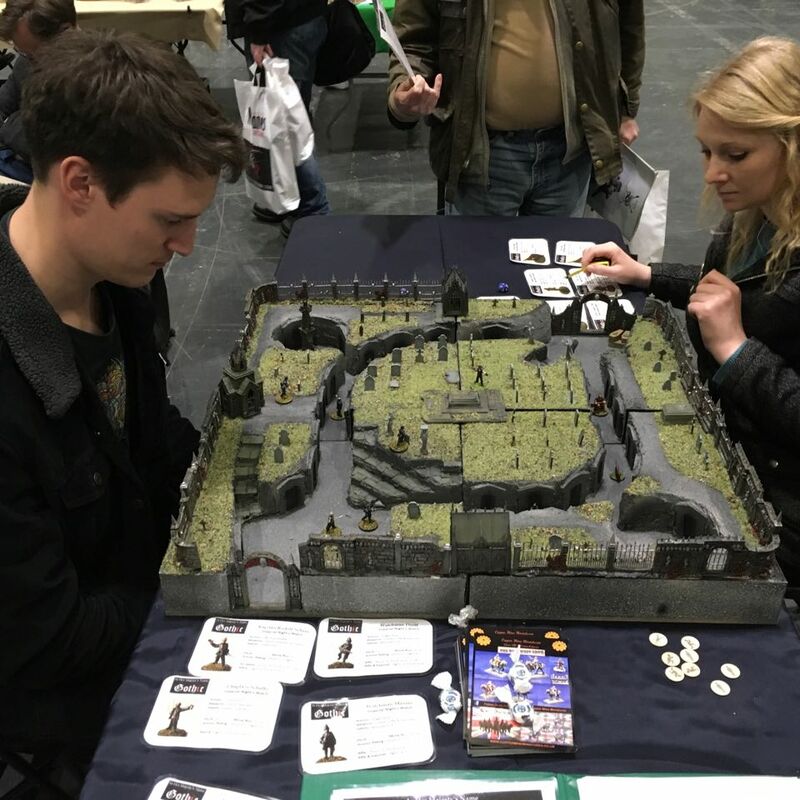 Some players were already aficionados of IHMN but most were playing their first games. The preparation we put into the figure cards and reference sheets really paid off here, making it much easier for people to get their heads around the rules. In most games people were up and running by the end of turn two, and everyone seemed to have a great time. Indeed, some of those manning adjacent tables were rolling their eyes at the amount of laughter and shouting going on in our small portion of the arena. As before the youngsters and the non-gamer partners really gave their regular gamer parents/friends a good run for their money. Every battle was closely fought with many going to the wire. We still had people playing when the Warlords began gently ushering everyone out. Viv Chandra of the gamers YouTube channel Rubbish-in, Rubbish-out. He came all the way from Australia to see us (and friends, family and others). Mark Byng, the creator if the IHMN Boardgame, and his friend Richard. Craig Thompson of Tiny Terrain, who provided so many great photos for the Blood Eagle book. Annie Norman of Bad Squiddo Games. A young lady who has a growing reputation as a trader and figures manufacturer. Simon Miller of To the Strongest! An old friend and fellow independent designer. 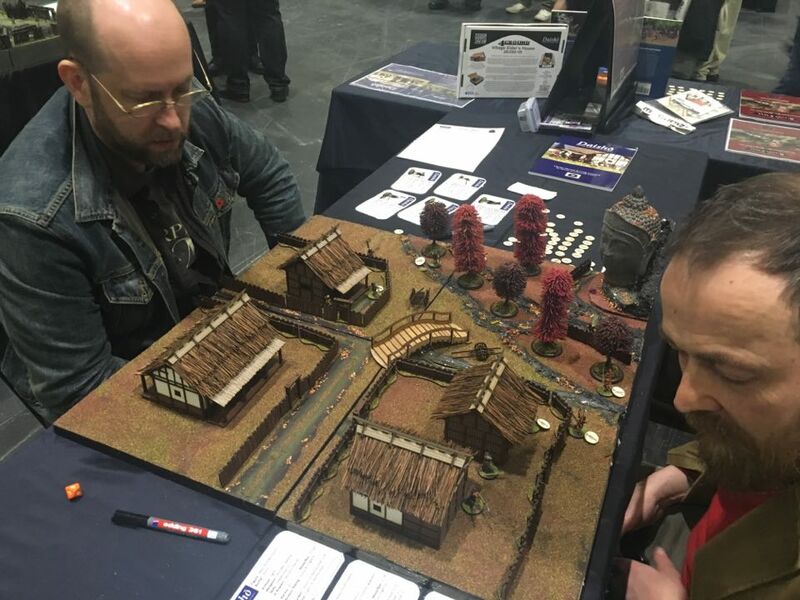 Karl and Mick from the White Hart Gamers. 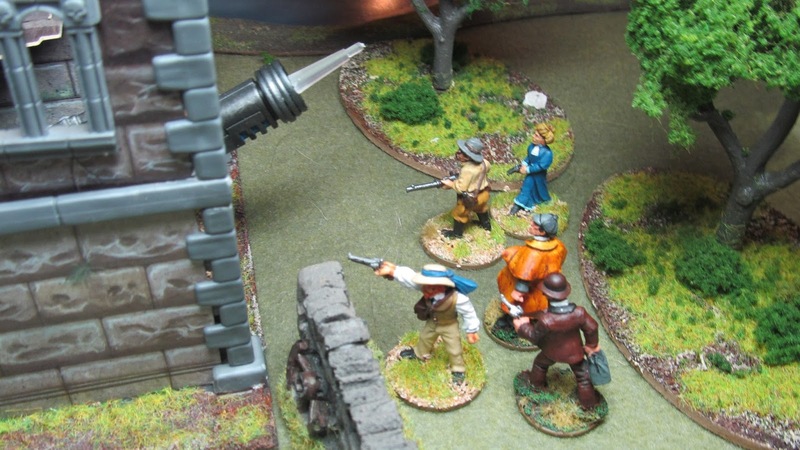 The original gang who demo’ed IHMN at Salute 2013. 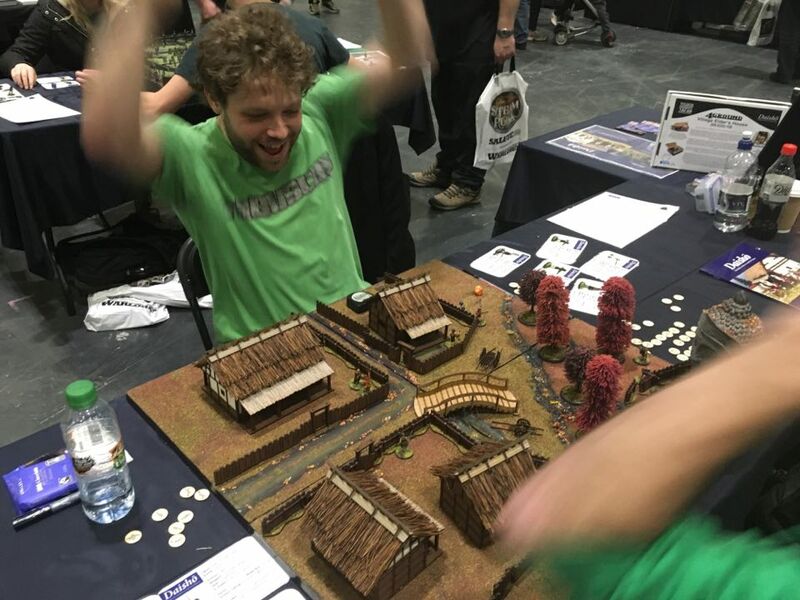 Nick Eyre of Northstar Miniatures, our friend and distributor of our rules. Dave WIse of the Games Club Network, the man who has put on more games of IHMN, at more shows, than anyone else on the planet. Tony Yates, friend, artist and all round good egg, with his regular opponent Alec. And in the dying moments of the day Ben and Lloyd from Beasts of War. There were so many other excellent ladies and gentlemen who stopped by to chat, ask about the games and even ask us to sign their copies of the books. This, I assured them, would double the value of the books should we suddenly and tragically die. Each of us managed to get a few minutes away during the day and do a quick walkabout. I must admit mine was a bit of a whistlestop as I rushed between the stalls selling Blood Eagle. Two fo the three sold out by lunchtime and even Northstar only had a handful left by close of play. I did not see much in the way of steampunk going on despite the theme, but that is more because I was rushing than any actual lack. We eventually made it back to the lair around seven and collapsed to partake of too much pizza and wine. Despite feeling like beaten men we agreed that we’re coming back next year. So a heartfelt thanks to all of you who managed to make it to Salute and say hello to us. It means a lot to us talking face to face with players. To those that didn’t we hope that this report and the photos, help give you an idea of what a frenetic and wonderful experience it is.